Safari140 is a plugin for Safari Browser which helps you post to twitter right from the browser and its the easiest way to post links that you are reading and want to share with your followers on twitter. Opens only when you want to tweet. Does not help you read tweets! 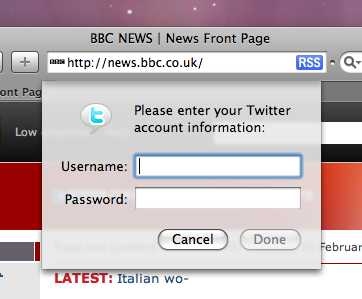 You can tweet about the website you are reading – Title automatically drops in! 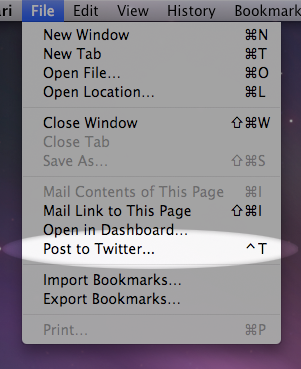 While on a page, just go to options and click on “Post to twitter” or use the keyboard shortcut ^ + T and the pop-up box appears for the first time to enter the credentials, and then you can tweet.